Why Buy This Type of Ice Maker? The party’s going great. Everyone’s got a drink in hand. The food is a hit. People are getting along and clearly having a fun time. Then, when the time comes for refills, you realize you’re out of ice. You don’t want your guests to be stuck with warm drinks, which means someone has to drive to the closest convenience store while everyone else waits. It’s not the end of the world, but it’s a pain to deal with. A portable ice maker can save you the trouble. Portable ice machines are simple little contraptions that do just what the name says: you pour in water and they make ice for you. They’re small in size, so they don’t take up much counter space and they’re easy to store when not in use. They don’t require a water hookup, so they’re easy to take with you on the go. As long as you can find a standard outlet and some (clean) water to pour into them, you’ll have ice within minutes. Designed to work fast, so you won’t have to wait too long for your next cold drink. 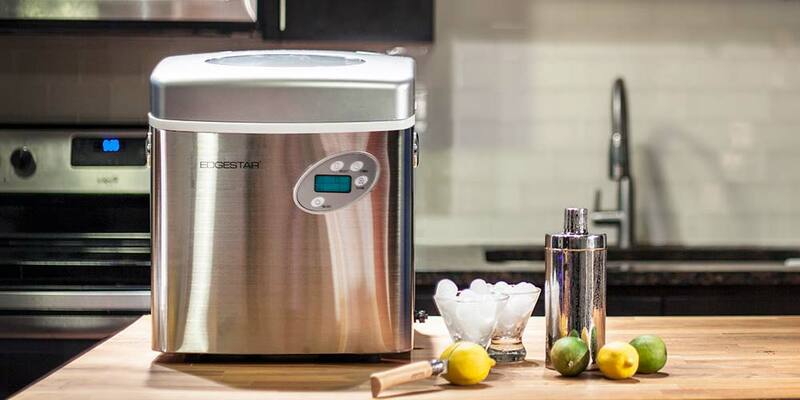 Portable ice makers make ice – but they’re not freezers. Before you buy a portable ice machine, this is an important distinction to understand. While they are designed to make ice quickly, this type of ice maker is not designed to keep its creation frozen for long periods of time. As the ice starts to melt, the water will trickle back into the reservoir and the device will start the process of refreezing it again. This process will continue until you consume all of the ice or empty all the water out of the machine. If you’re looking to buy a standalone ice maker that will device the contents within frozen for long periods of time, you will likely have better luck with a built-in unit. Of course, these ice machines will naturally come with a higher price tag, as well as some installation requirements. Neither of these machines are inherently better than the other. 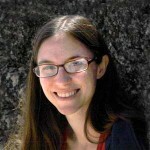 They each have their own set of pros and cons, as they are designed for specific uses. However, before you buy either type of ice machine, it’s important to have a realistic idea of what you’re getting and how you intend to use it. They’re also useful in a number of other spots where people need more ice than a freezer’s ice maker produces, like in office break rooms or retirement communities, where a lot of different people want to be able to refill drinks throughout the day. And of course, they can be useful in many homes, both for parties when you have more guests over than you can accommodate with the ice maker built into your fridge and for families that simply go through a lot of ice every day. If you regularly find yourself in situations where you need more ice, then a portable ice machine is going to be a convenient and affordable solution, allowing you to never again buy a ice at the convenience store. If you’re convinced it’s time to buy a portable ice machine, you’ve got a few main factors that we would recommend you keep in mind to help you find the right one for your particular needs. For the most part, portable ice makers will be on the small side, that is what makes them portable, but you will find some variety in how much space they take up and the amount of ice they can produce or store. Manufacturers provide will provide the dimensions and the capacity rate in their product specs, so it will be easy to confirm that you’re buying the size or capacity you need. If your portable ice maker will spend most of its time sitting on a countertop in your home kitchen, RV, or boat, then you should double-check how much space is available in that spot to ensure that you don’t end up with a machine that won’t fit. However, if you aim to carry your ice maker from place to place or only use it when you have company over, then we would recommend checking the weight of the device to make sure it’s something you’ll be comfortable carrying. If size and weight aren’t particular concerns, then the main thing to think about is the capacity. You want a machine that can hold as much as ice as you need, unless you’re okay with bagging the ice to move it a freezer to store. An ice maker that’s too small won’t fully solve your problems, and one that’s too big will likely just waste energy and space. Carefully consider how much ice you think you will need before making your purchase, as this will help you narrow down which ice maker will be best for your unique situation. In addition to figuring out the amount of ice you need your ice machine to hold, you need to make sure it will make ice quickly enough for you. The production capacity is usually provided in pounds of ice per day. If you and your family or office mates regularly go through a lot of ice, or you want to be confident that your party guests will never have to wait on a refill, then the higher the production capacity the better off you’ll be. If you’re going through ice quickly, be aware that someone will need to take a minute to pour more water in. Part of what makes this type of ice maker “portable” is that you don’t have to hook them up to a dedicated water line. While this eliminates any complicated installation requirements, you’ll still need to continually add water manually. It’s not a big job, but it is one that someone will need to be sure to do to keep the ice from running out. Most manufacturers also make it clear in their product specs how long you can expect to wait until you’ll start to get ice. Most countertop ice machines will begin to produce ice somewhere in the range of 10-20 minutes after you first add water and turn them on. This will vary from model to model, so if speed is an important factor for you, then you will want to be sure to keep an eye out for this. Portable ice makers are a relatively affordable appliance. They typically start at around $100, and then vary in cost up to about $250 for higher-capacity models. All in all, that’s not a huge range in cost. A close look at the reviews suggests that going a step up from the most affordable models in cost typically means ending up with a machine that lasts longer. A lot of the cheaper ice machines start seem to have problems within the first year, especially when they are used heavily. Durability is going to be the main reason why you should consider going with a unit that cost a bit more. If you plan on using it frequently or keeping it plugged in at all times, then you will want to consider spending a bit more to ensure you get an ice maker that is designed to last. 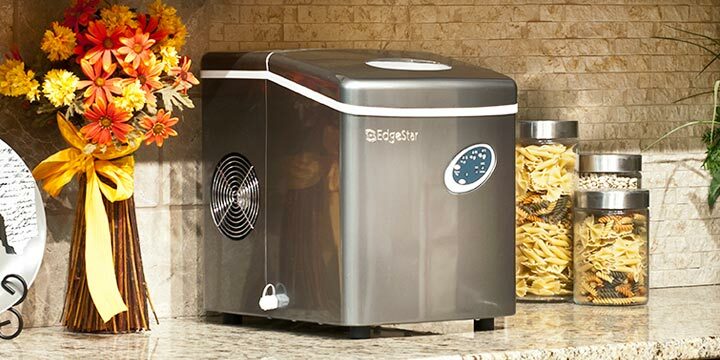 However, if you only plan on using it for special events or when you have guests over, then a lower priced ice maker will likely fit your needs. Production capacity is another factor that will play a role in the overall price. The higher-capacity models will likely cost a bit more. There are a few features that may also push the cost of a machine up as well, like intelligent water use or easy-to-use controls. If your portable ice maker will consistently stay on a countertop, then you will likely want to consider which of the models available will look good there. As you browse your options, you will quickly notice that countertop ice makers are available in a range of colors and finishes. The most common colors will be black, white and stainless steel. However, you will also find plenty of units available that allow you to add a splash of color. So, if all of your appliances are red, you’ll have options to match. The aesthetic appeal is purely subjective, so you’ll just have to browse your options to see which models you like the most and which ones you believe will match the current decor of your home. In general, portable ice makers are pretty easy to use. Most of them have intuitive controls, basic instructions, and no real installation requirements (you just need an electrical outlet). Some may have slightly easier to use controls than others, and some include features that make it easier to tell when the ice machine is full. On the whole though, you shouldn’t be too worried about being able to figure out how to use a portable ice machine. Freezing water is hard work. As such, any machine that isn’t especially well made is likely to have issues within a relatively short amount of use. Unfortunately, portable ice machines aren’t the type of appliance you can count on buying once and using for a decade or more, even most of the highest-quality models are unlikely to last that long. But spending a little more can often be the difference between getting a year or less of use or a few years out of your machine. Some portable ice makers come with warranties, which will give you a head’s up as to how long you can count on the machine to last (or provide the peace of mind that you’ll at least get a replacement if there’s a problem). Others allow you to purchase a warranty, which may well be worth the cost based on how many reviewers of various models had issues. The best way to gain an idea of how long you can expect your portable ice maker to last is to read the reviews. People will complain if their model doesn’t last long enough to satisfy, and many also take the time to praise a machine that works without problem for a decent amount of time. One of the nicest features that a portable ice machine can offer is intelligent water use. If you don’t use all the ice your machine creates before it melts, the ice machine will re-use it and turn it into ice all over again. Since countertop ice makers don’t keep the ice frozen, without this feature your risk wasting water that just gets thrown out if you don’t either transfer the ice to a freezer or use it quickly enough. And you’ll have more of a mess to deal with in between uses. Intelligent water use saves on water, saves you the trouble of having to refill the machine, and ensures you can use the product without running out and having to add new water as often. Self Cleaning — A self-cleaning ice maker makes the most tedious part of using a portable ice maker – cleaning it – much easier. Automatic Timer — An automatic timer makes it possible for you to set a specific time for the machine to make ice, so it’s ready for you at the particular time you need it. Ice Size Selection — Some portable ice makers let you choose between two or three different sizes of ice based on your personal preferences. 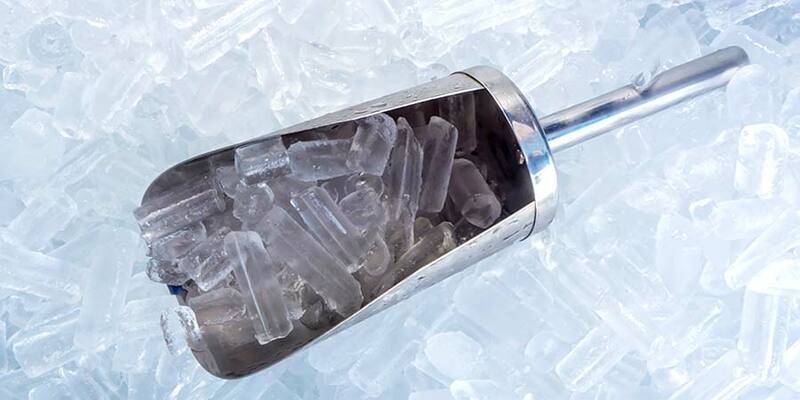 Ice Scoop — A few portable ice makers come with an ice scoop included. An ice maker has a fairly tough job to do — freezing water isn’t easy. For a portable ice maker that can get the job done without wearing out quickly, you should go with a brand that has a strong reputation. 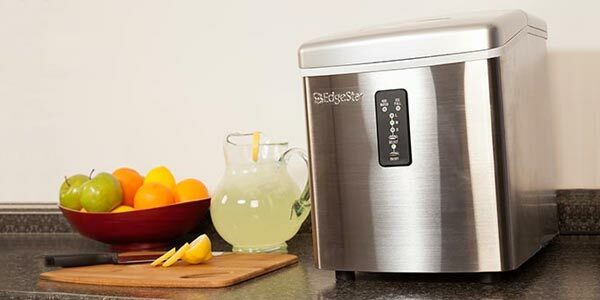 To give you a better idea as to which brands typically provide the best performance, we analyzed all the customer reviews of ice makers made by some of the top brands in the space. Here’s a summary of what customers are saying. Avalon Bay sells a stylish portable ice maker that is available three different colors. While many customers love that they can own a red ice machine, others seem to have experienced issues with their units. The happy customers say their ice machines work well and make ice fast. Those who are less satisfied complain that their units were noisy and loud, which emcompasses the primary complaint about this brand. Other customers state that their ice machine didn’t last long when they used it often. If you don’t mind the noise, you’ll likely be happy with your Avalon Bay ice maker while it lasts, but shouldn’t count on it having a long life. Danby’s portable ice makers get great reviews from customers that say the machines make ice fast, work like a charm, are easy to use, and last for a long time. A few reviewers mention the ice tasting funny at first, but one reviewer returned with an update to say that the taste wears off after a couple of batches of ice. A few customers mention being quick to recommend Danby to others. This is definitely one brand you can count on when it comes to buying a countertop ice maker. EdgeStar has a wide assortment of portable ice machines that come in an array of colors and finishes. As the industry leader for this type of appliance, it’s no surprise that customers are routinely pleased with their machines. Most reviews for EdgeStar mention that they’re easy to use and make ice fast. 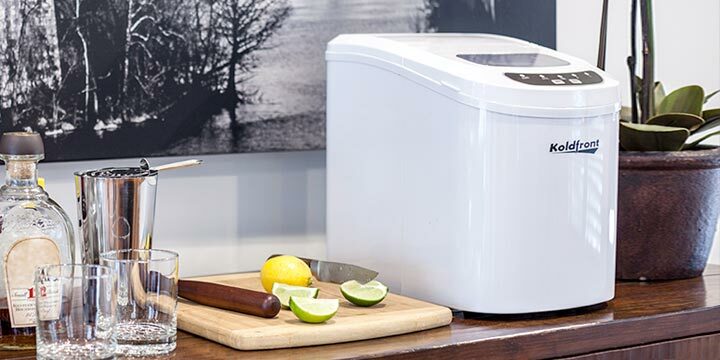 Many reviewers are repeat customers who were happy with how long their first portable ice machine lasted and came back to the brand for the next one. Their reputation amongst customers is strong. This is one brand you should definitely consider while looking around. Igloo sells a few portable ice makers that all garner mixed reviews. The majority of their units are still on the positive side, with many customers saying their ice machine is fast, quiet, and easy to use. However, other customers describe machines that stop working within a couple of months, along with with frustrating experiences getting the run-around from the company when they try to claim the warranty. The cost is low with Igloo, but you’re risking ending up with a product with a short life. If you decide to go with an Igloo ice maker, be sure to take a close look at what customers are saying about the model you are considering. 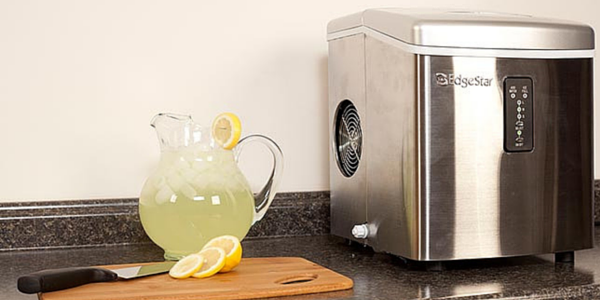 Ivation is another affordable brand that sells portable ice makers that earn mixed reviews. Most customers praise their ice machines for working fast, being easy to use, and making lots of ice. A number of reviewers complain about how quickly they stop working though – some saying they only got a few weeks or months out of the machine. As with Igloo, you can save some money upfront, but may end up looking for a new portable ice maker soon if you go with Ivation. 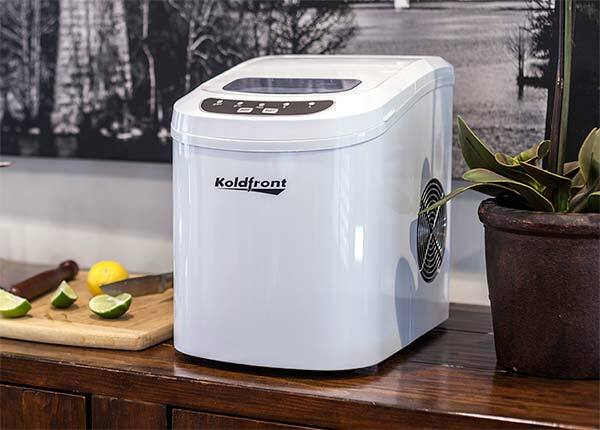 Koldfront has a couple of affordable ice maker earns predominantly positive reviews for being efficient, quiet, and easy to use. Most customers are satisfied with their purchase, but like the other more affordable brands on the list, there are some unhappy reviewers in the mix who say their ice machine didn’t last very long. Other reviewers talk about using theirs for years without an issue. There’s a decent chance you’ll be satisfied with a Koldfront portable ice machine, but at least some chance that you’ll end up with one of the lemons that don’t work as well. Magic Chef makes a variety of countertop ice machines that earn relatively mixed reviews from customers. The majority of the feedback is positive, with many customers saying that their units work well, make ice fast, and are a good deal for the price. Unfortunately, many of their units don’t have any reviews at all. All signs point to Magic Chef being a reliable brand to consider, but be sure to do the due diligence on researching the model you’re thinking of buying. Portable ice makers offer convenience and will quickly save you money if you’ve been buying bags of ice from the grocery store with any regularity. They’re an affordable solution to an irritating problem. Find the right portable ice maker for you and ensure you’ll always have plenty of ice in your home, during parties, on camping trips, or at the office. I am looking for a portable Or countertop ice machine or ice maker that makes soft crushed ice like the ones you find in hospitals! What are they called and where can I find one at a reasonable price? I was looking for the best under counter ice maker for my new kitchen. I saw some of the best ice maker machine’s such as della portable ice maker, igloo, ivation etc. I got a brief idea about each of them & would say that della portable ice maker is the one which is liked the most by me and would recommend the same. countertop ice makers make “warm” ice only a degree or two below freezing which melts a few minutes after mixing with room temp liquid. Your refrigerator ice maker makes ice at approximately 0 degrees F. (32 degrees below freezing) and that is why it lasts so long.